For Service 859A in the reverse direction, check out Service 859B. 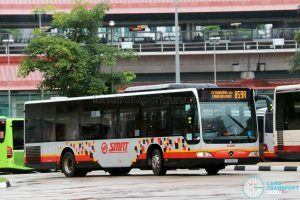 SMRT Bus Service 859A is a trunk route from Sembawang Interchange and looping at Admiralty Link, passing through Canberra Road and Sembawang Crescent in a counter-clockwise loop fashion. Service 859B plies the same route in the clockwise direction. 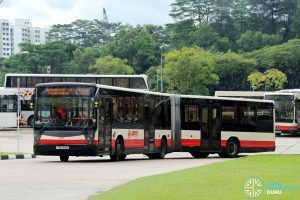 Both 859A and 859B are route variants of Bus Service 859 serving only within the Sembawang residential estate, and were introduced in their present form under the Bus Service Enhancement Programme (BSEP). They were launched on Sunday, 17 August 2014. Bus Service 859A is a route variant of Bus Service 859. 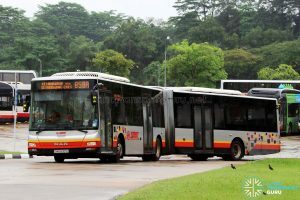 It duplicates Service 859 within the Sembawang residential estate, departing Sembawang Interchange and making a counter-clockwise loop via Canberra Rd, Admiralty Link, Sembawang Dr, Admiralty Dr and Sembawang Cres before terminating at Sembawang Interchange. Service 859A was previously a short-trip service terminating at Opp Blk 315, Sembawang Vista (outside Sembawang Interchange), operating from 12:00am to 12:50am after the last bus of Service 859 towards Yishun has departed. Service enhancements as part of the Bus Service Enhancement Programme (BSEP) upgraded it to a full-day supplementary bus service. In addition, a Service 859B was introduced, plying the same route as Service 859A in the opposite direction. The A and B suffixes used do not represent these routes as Short-Trip Services, but as route variants of Service 859. Such route numbering is similar to the Green and White plates (G/W suffix) used on SBS Transit feeder routes to indicate different directions of travel. 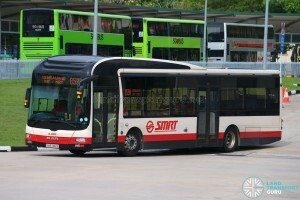 Both routes were launched on Sunday, 17 August 2014, to improve bus connectivity within the Sembawang estate and aid with high passenger loading on Service 859. The routes connect to public amenities such as Canberra Community Club, Sembawang Library, Sembawang Mart, Sembawang MRT Station, Sembawang Secondary School and Sun Plaza. 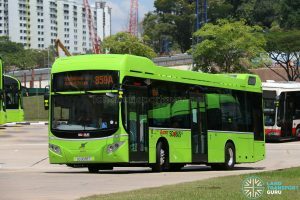 The Bus Service Operating License (BSOL) for this route will be renewed in 2020 under the Sembawang – Yishun Bus Package. 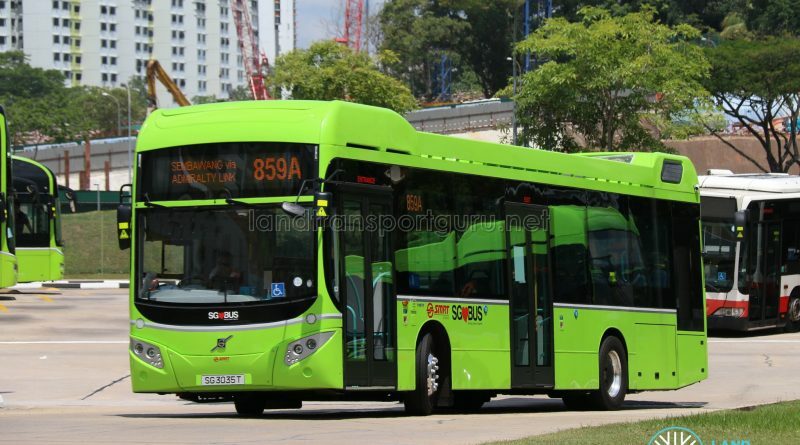 2014 (17 Aug): Service 859A amended to its present form and Service 859B introduced under the BSEP. Both routeswheelchair-accessible at introduction. 2014: No significant route changes since 2014. Last Tuesday I took SMB157S on 859A Full Route and SMB248M Training Bus was seen doing training along almost the full route of 859A. 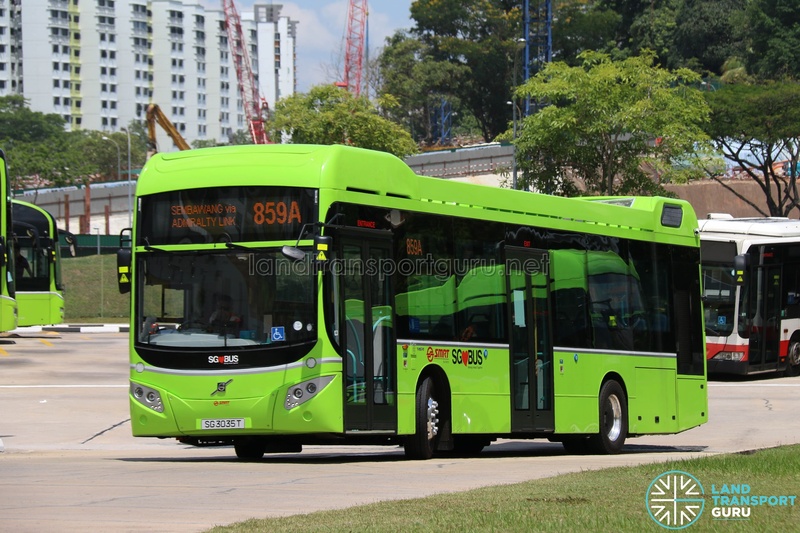 Enviro500 performed on 859A during evening peak on today 19 March 2019.